There are many times in our lives when we desire to find joy by letting things go. Possibly the most challenging and yet potentially most rewarding, is the joy of letting go during major life transitions. Life transitions are an opportunity to let go of your own limitations, expectations and the constructs that keep you playing small. Discarding the beliefs that stop you doing what you want to do. Times of significant life change are ideal to reconsider what you truly desire and let go of everything else. There are many times in our lives, the most common of which is New Year, where we take stock, pause, reflect and consider our life journey thus far, and where we see ourselves going in our lives. Yet during points of transition or significant life events (such as the loss of a loved one or a career change), we often have to pause and reflect. Frequently, times of transition act as a catalyst to inspire us to make significant change in our own lives. The enormity of the change we are experiencing often dictates that we have no choice but to reconsider our life path. During these times, we undertake deep reflection. Transitions invariably involve a lot of change, and through the pain of the changes we are experiencing, we realise we need to let go of certain aspects of our life. It could be old views of ourselves, habits, friendships, or belief systems that need to change to be aligned with the new person we feel we are becoming. And thus, we change and adapt to the new. And we also let go. As we live through significant change, we evolve. As we evolve and grow, realisation can strike that everything we've been working towards is not what we actually desire. This can feel painful, and challenging to grasp. To let go of dreams and hopes, because they are no longer aligned with who you are, or where you want to go, is incredibly hard work. It involves hours, days or even weeks, of deep internal reflection, contemplation and consideration. Slowly, as the magnitude of the realisation dawns upon us, it feels terribly uncomfortable. Like you're trudging through mud and it is hard, messy and dragging you down. Letting go should be a release, but to get to that point can feel like serious drudgery, and even harrowing. There are a few different approaches to letting go of things that no longer feel aligned with who we wish to be. For some, (not me, I confess) it is simply a matter of making the decision. These people (like my husband) simply decide they are no longer going to do something, and that is it. They don't do it, ever again. For the rest of us (the normal, human folk! ), it is less simple. Most of us require support, or continual practice in letting go of things that we have held onto for years, or even decades. The idea of who we are, the goal of who we were to become, the concept around the type of person we are, and how we show up in the world - to let go of any of these takes time, practice and daily reminders. The simplest way I have found to let go of things that I wish to relinquish, is by starting small. Taking a day-by-day approach makes it manageable, and I hope, more achievable. You can start with raising your awareness. For a day, a week or even a month just notice the belief that you are trying to change and when it appears. No judgement, just awareness. Notice in a detached, observing kind of way. Simply acknowledge to yourself the belief exists, and then let it go. Don't dwell on it, just let it pass through your thoughts and move on. But for those of you, who prefer a more practical approach, you may wish to record how frequently those thoughts occur. (I like to keep track on my smartphone – I always have it with me and the notes function works well for recording all sorts of random things). If you are finding your thoughts frequently return to this belief system, approach or habit, you know you have significant work to do before you can let it go. Personally, I have found a mix of techniques support me in my efforts to let things go. Forgiveness – a lot of forgiveness work is required when you are desiring to change yourself and your approach to the world. Tapping - use of Emotional Freedom Technique (EFT) has been useful in helping release old belief systems and very beneficial for reframing experiences, and working with forgiveness. Journaling – as I have shared before, journaling your thoughts is incredibly powerful. Whether it be a single sentence journal, or two or three pages each day, journaling is a powerful and inexpensive way to uncover your belief systems, and work through them. If you wish to make habit change, a daily journal practice can support you in doing so. Purpose - knowing my 'why' and being connected with how I want to feel acts as a powerful reminder to stay focussed. It also motivates me to change. The suggestions I share here I have found work well for me. If you are keen to learn more, get in touch and I'm happy to share more with you. Alternatively, there are thousands of resources all over the web that can give you more details on any of these four approaches. Ultimately, letting things go, whilst challenging, brings much joy. 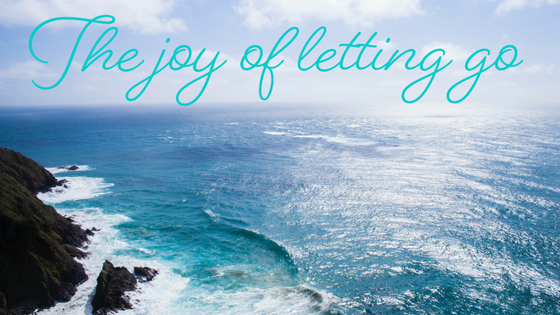 Especially when the process of letting go results in a more joyfully lived life. When you let go of the beliefs holding you back, you step more joyfully into the life you want. A life lived on purpose; full of joy, hope and love. If you like this post, please feel free to share it with a friend who may also benefit from reading it. I love to support people find the joy in their lives - and I'd love to help you too! Book in for your complimentary consult and we can chat about how we can work together.